How Far is Bhagini Srinivasa Nagara? 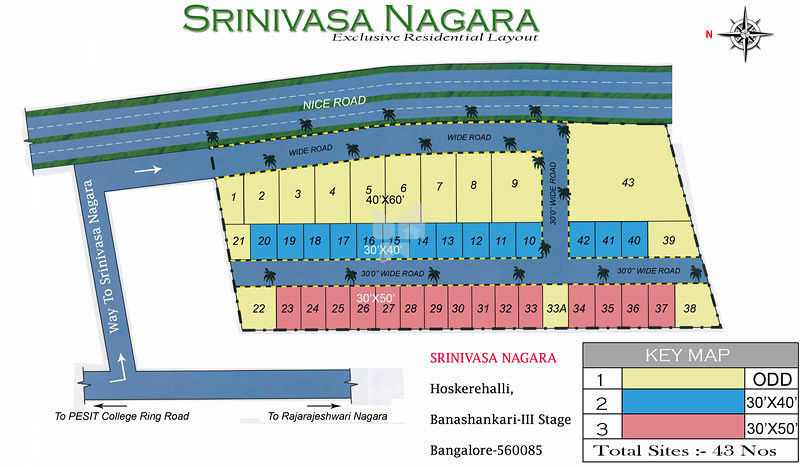 “Sriivasa Nagara” is a Residential Layout Project Approved by BBMP. It is spread across 3 Acres. Located strategically to PES Engineering College, TATA Promont Apartment Project & Prestige South Ridge Luxury Apartments. It is located within the radius of 10 kms from Majestic. Very good connectvivity to Electronic City Phase 1 and 2, Biotech Park, Bharnegatta Road, Kanakapura Road, Bidadhi Industrial Area, Global Village Tech Park, Kalyani Magnam Info Tech Park, Mysore Road, Peenya Industrial Area, Tumkur Road (NH-4) by using nice road and outer ring road we can reach to any place with in 15 minutes. Very close to PES college of engineering, Global Acdemy Technology, BMSIT, Bangalore University, RV Engineering College, Dr Ambedkar Engineering College, Don Bosco Engineering College, Kempegowda Medical College, Bgs Global Medical College and Hospital, Rajarajeshwari Medical College, Little Flower School, Mount Carmel School, National Hill View School Etc. DG Hospital, Raja Rajeshwari Hospital, BGS Global Hospital, Netradhama Eye Hospital, Ring Road Hospital, Udbhava Hospital, Kidney Foundation etc.